Let's say you wanted to find all of the TEXT in the drawing on the NOTES layer with a height of 1/2". 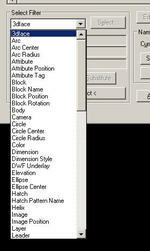 Or maybe you wanted to find all of the Window blocks that are NOT on floorplan layer. Most of you out there in the AutoCAD world know all about the QSELECT command, but those of you veterans out there know about the even more powerful FILTER command. When you really need to step up your object selection using specific details then this is a great command to fall back on. This top secret command can no longer be found in any of the menus (and I mean ANYWHERE) but you can still access it from the command line. And FILTER command is transparent so you can pull it out of a hat whenever you need it by placing an apostrophe in front of it ('FILTER). The FILTER command allows you to select, edit and save named filters for object selection (which means once you have your filter set up you can save it for future use!). Note: Don't confuse this with the FILTERS (plural) command - these two commands serve entirely different masters! Now I admit that this dialog box is not for the faint of heart, but it is really much easier than it looks. 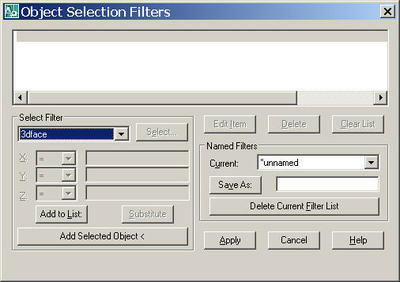 You simply select the properties of the objects you want to filter by as seen below. 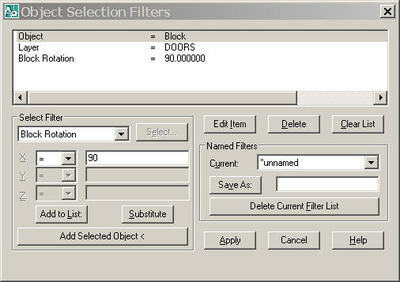 The FILTER command has a much more extensive list of options than the QSELECT command - below you see just about half of the many, many options you can choose from. Below you'll see that I've asked AutoCAD to find all the Blocks on the Doors layer that have a 90 degree rotation angle. You can also choose a selected object from the drawing and the FILTER dialog will populate the list with all of the info on that object. Then you can simply delete any information you don't think is relevant. You can also use "And" and "OR" as well as various other conditions to control the filters (this gets a little more complicated but it isn't as bad as it looks). At the end of the Filter list you'll find a variety of conditions to help you get the exact results you are after!